Clear Lake City Golf Course goes Native! 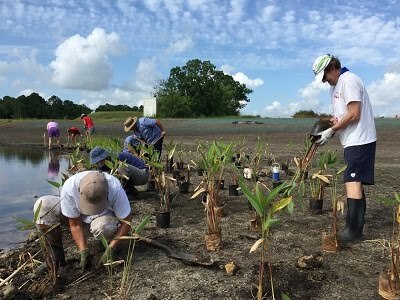 Between June 9th and June 26th, volunteers, including Gulf Coast Master Naturalists, at Exploration Green began establishing the first native wetland plants on the site of the old Clear Lake City golf course, which is now a 200-acre conservation easement signed with Galveston Bay Foundation. Over the course of four planting events, volunteers worked at the Phase I development site, the first of several finger lakes that will run through the park. Volunteers installed more than 3,000 plants, including Spartina spartinae, Iris virginica, Crinum americanium, and Cyperus articulatus. Each planting event drew between ten and forty volunteers, and work was overseen by Mary Carol Edwards, Stormwater Wetland Program Coordinator, Texas Coastal Watershed Program, Texas A&M AgriLife Extension Service/ Texas Sea Grant. This phase of development is something the citizens of Clear Lake have been waiting a long time to experience, and it represents a major milestone in making Exploration Green become a reality. Additional finger lakes in the Phase I site will be completed by the end of this year, so there will be additional native wetland and tree planting events in the future. Mary Carol hosts regular work events most Thursday mornings at the native wetland nursery and other sites; check with her (mcedwards@tamu.edu) for more information about locations and times. The tree nursery sponsors workdays the second Saturday and last Sunday of every month. In the summer those events go from 8:00 to 11:00 a.m. Contact Jerry Hamby (jhamby4@comcast.net or jerry.hamby@txgcmn.org) for more information.